How Much Does a Tensiometer Cost? Tensiometers are instruments used for conducting surface analysis on liquid substances. Typical applications Tensiometers perform include measuring surface tension, interfacial tension as well as liquid density and Lamella Length on some Tensiometer models. Some models can also perform other tasks including powder wettability and dynamic contact angle of a solid substrate. Depending on the types of information the operator is seeking to find one model may be more appropriate than the other. This matrix is not necessarily brand specific as it was designed to help those seeking to compare capabilities and prices among popular manual Tensiometer models vs. popular Automatic or "digital" Tensiometer models. 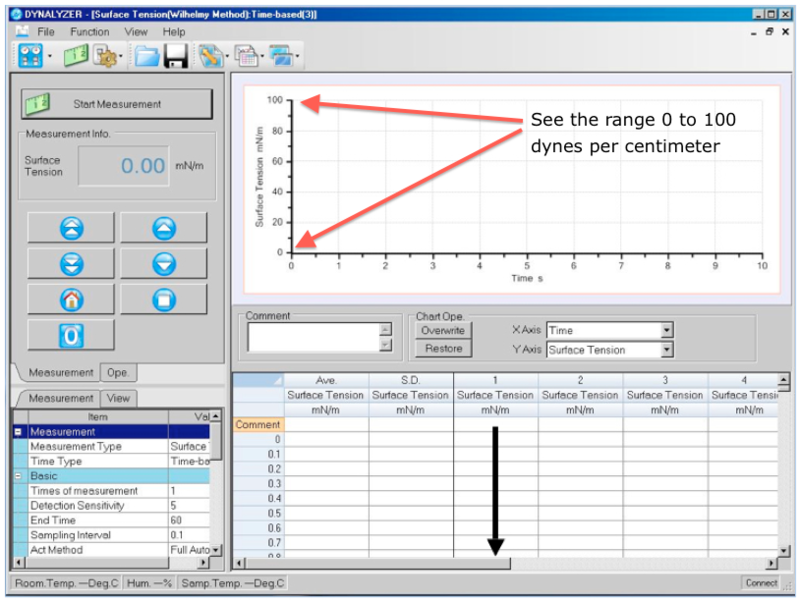 We hope you find the Tensiometer Selection Matrix helpful in your search and evaluation of Tensiometers. 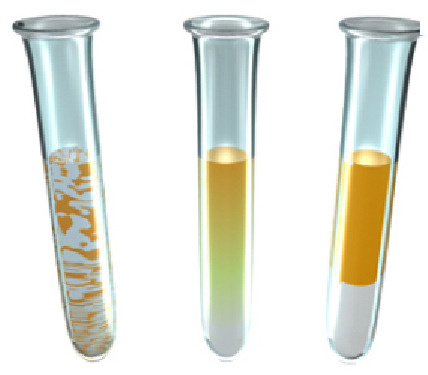 Measuring interfacial tension is effective in understanding how two or more immiscible liquids are, or can be - emulsified. Immiscible liquids by definition are liquids incapable of being mixed to form a homogeneous substance. Oil and water are immiscible. We can act upon these immiscible liquids by emulsifying them into a single homogeneous substance referred to as an emulsion. Emulsifying two liquids that ordinarily do not mix well -such as oil and water- causes tiny droplets from one liquid to be suspended in the other liquid - forming an emulsion. We refer to a liquid as a phase. Where one phase meets another phase (liquid to liquid - oil to water for example) a boundary forms between them and an imbalance of forces occur. The amount of the imbalance can attribute to an energy at the point where the two phases meet. We refer to this energy as surface free energy where a measure of energy/area or interfacial tension as force/length can be observed. Increasing the interface area by dispersing one liquid phase into another by emulsification or the use of a surfactant for example will result in a lower interfacial tension. 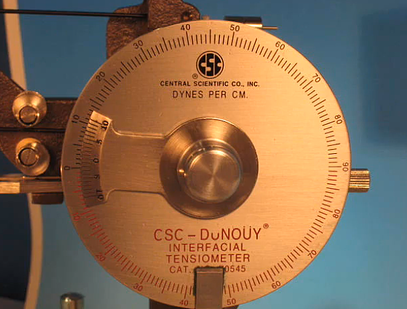 The Interfacial Tension is measured in Dynes per Centimeter using an instrument known as a tensiometer. Developing fluid separation and dispersion of oils in dressings and mayonnaise are very commonly studied for food R&D. Developing new cosmetic formulations are also popular and important. We all know that surface tension affects our daily lives thru everyday applications like the ink you use in a pen, detergents for washing clothes, soap to clean your hands, paint for the house, just to name a few. But Surface tension is more involved in your life than you may think. Tap water is usually around 72 to 73 dynes/cm. This can vary by temperature and other variables but for the sake of this blog post we will assume 73 dynes/cm. Now this is where it gets interesting. At 73 dynes/cm water will hydrate you. Or does it? You see, It is known that on a cellular level your body has to convert fluids to 45 dynes/cm to allow the water to penetrate the human cells. Once water penetrates the cells it can hydrate and remove toxins from the cells. If water cannot effectively penetrate human cells an accumulation can build up and over time cause the cells to die. Amazingly, I have seen places around the world where people claim to have special water. They claim their water has a lower surface tension and less colloidal minerals. You knew this was coming..Yes, these same people have demonstrated good health as they easily live to be 100 years old! And yes, they attribute this to their water. Not surprisingly, I see web sites now that sell supplements to lower the surface tension of water to improve your health. Fact or Fiction you ask? I think I am going to order some of these supplements and check it myself with a digital tensiometer! As they say the proof is in the pudding. Or in this case the surface tension! Stay tuned. I will update my findings and how I did.